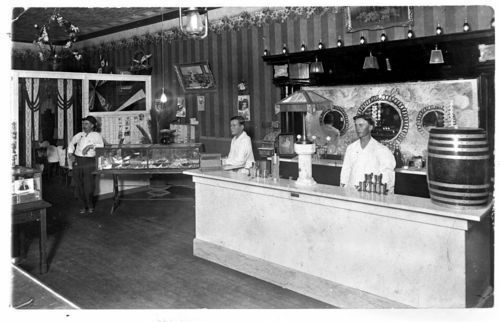 This black and white photograph shows two employees standing behind the counter of a soda fountain in De Soto, Kansas. To the left a gentleman is visible standing in front of a display case. The town of De Soto is located in Johnson County on the south bank of the Kansas River and along the Atchison, Topeka and Santa Fe Railway Company line.